So what exactly is a Humanist wedding? A Humanist wedding ceremony is very much about you, the couple – it’s about two people celebrating their love for each other and making a commitment to one another in the company of those who are closest to them. It allows your family and friends to gather together as a community with you on your wedding day. It is a non-religious ceremony designed to be a positive option for those who share the same philosophical belief system and general outlook as Humanists. 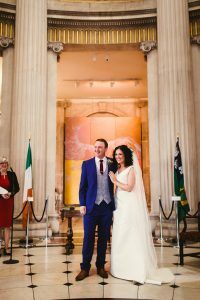 It is typically made up of an introduction (traditional bridal entrance if you wish), words on love and marriage, music, readings, a symbolic ritual or two, vows, marriage declaration, exchange of rings, signing of the register and closing words – you can personalise your ceremony to suit you. Can you marry us legally? Yes I can. I am accredited by the Humanist Association of Ireland and as such am on the list of registered marriage solemnisers in Ireland – this means I am authorised to legally marry you on the day once you have given a minimum of 3 months’ notice of your intention to marry to a HSE (Health Service Executive) registrar and have all paperwork in order with them first. How do I contact the HSE? There are HSE registrars in every county and you can contact them by phone or make an appointment through their online system. More information here on their website. How far ahead do we need to book you? As early as possible is a good idea. And you also need to have me booked before you have your appointment with the HSE as you will need to give them the name of your solemniser. Where can we have our wedding ceremony? In order for me to marry you legally, the ceremony must take place at a recognisable address and that venue must be open to the public. Yes, once it is in a garden or an area that is part of the venue as described above. What is the Marriage Registration Form? This is a document that you will be given by the HSE registrar you are dealing with once you have provided them with all the information and paperwork they need. It must come with you to the venue on your wedding day as it is document that we sign on the day. It is signed by you (both parties to the marriage), your two witnesses and me. Can anyone act as a witness? Yes, once they are over 18. When you have your appointment with the HSE you must give them the names and dates of birth of your witnesses. Do we meet with you? Yes. Generally speaking I meet with couples about six months before the wedding day. If it’s not possible to meet in person, we can do a Skype or phone call. If you have any questions before then I’d be happy to chat with you on the phone. We can also meet again in the few weeks before the big day if you’d like to talk through the final draft of your script. Will you write our ceremony script? Yes, with input from you. When we meet I will talk you through a script template and discuss the various options you have to personalise it to make it your own. We will then work together over the following months to finalise the script. Do we have to have a traditional entrance procession? That is a personal choice entirely. Most weddings do start with a traditional bridal entrance, but couples do all sorts of different things, such as coming in together, a bride coming in with both parents, not making an entrance at all – it’s entirely up to you. Music really enhances a ceremony and allows you to personalise the occasion by making your own choices. Live music is wonderful if that’s possible, but recorded music works fine too. What about readings and rituals? By carefully selecting readings and rituals you can really personalise your ceremony. When we meet I’ll explain the various rituals to you and I’ll also make suggestions for readings, but you are also very welcome to make your own suggestions. Do we need to bring props for the rituals? Yes. If you decide to go with the unity candle ceremony for example, you’ll need 3 x candles either in a floral arrangement or in stands. Or if you are doing the sand ceremony you’ll need to bring the sand and containers. Do you have any references from couples you’ve already married? You’ll find photos and testimonials from couples I have married on the Wedding Gallery & Thank-you’s page. The best thing to do is to email me on siobhan@siobhanwalls.com. Please include your date and venue in the subject line. I always try to respond to emails within 24 hours, though this can be longer over a weekend as I will likely be busy conducting ceremonies. Do you travel to all parts of the country? If I am available I will respond with more details and ask you for any further information I need. I will hold the date for you for one week. Assuming you want to go ahead with the booking, let me know within one week. I will then confirm the date in my diary and send you on a letter of confirmation for your signatures, together with an invoice. To fully confirm your booking, I’ll ask you to return the signed letter to me and to pay a booking deposit by bank transfer within two weeks. Once the booking has been fully confirmed, you can expect to hear from me again about six months before your wedding day to set up a meeting. If I am not available, I will let you know and suggest you try other celebrants on humanism.ie.